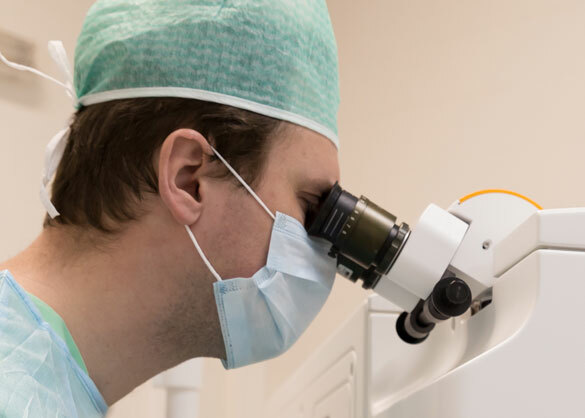 The corneal transplant procedure has evolved over the last century; and today, it is safely and routinely performed as an outpatient procedure on thousands of patients each year, by experienced cornea specialists, like Dr. John Goosey. The procedure has various forms, which are utilized based on the patient’s particular disease. One of the most exciting innovations in corneal transplantation is a technique called DSAEK. Before we dive deeper into corneal transplantation, it was once said, ‘The eyes are the window of the soul’. Leonardo da Vinci was fascinated by the dynamics of vision, and considered sight “the best and most noble” of our senses. While da Vinci’s philosophy may be intuitively correct, it is an anatomical fact that the cornea is the window of the eye. The cornea is analogous to a clear watch crystal or window on the front surface of the eye. Light must pass through the cornea before the incredibly complex and miraculous visual process can occur. When the cornea is structurally altered by trauma or certain diseases, it becomes cloudy and often, vision is impaired. In such cases a corneal transplant is needed to restore sight. Occasionally, either through disease or injury, the corneal tissue is damaged to a point where light can no longer effectively pass through it, resulting in reduced vision. Where indicated by an ophthalmologist, corneal transplants may be performed which replace the damaged cornea with a clear donor cornea. This is an extremely delicate microsurgical procedure. The corneal transplant procedure is used to visually rehabilitate patients with Fuchs’ Endothelial Dystrophy and psuedophakic bullous keratopathy in a fraction of the time required by the older, more conventional corneal transplant procedure known as PKP. Other exciting innovations also have occurred in ALK (anterior lamellar keratoplasty). ALK is used to visually rehabilitate patients with keratoconus, corneal scars, and mal shaped corneas following RK or LASIK surgery. The beauty of this procedure is that the patients can be rehabilitated with no fear of corneal endothelial graft rejection. Once the decision has been made, you will be less anxious and feel more in control if you know what to expect – what the “normal” routine is for this type of surgery. The more information you have, the more prepared you will be. It is a good idea to contact your insurance company prior to scheduling your surgery to check your coverage and any pre-authorization requirements. Ask exactly what will be covered and what will not. Ask especially about your post-operative office visits, glasses and/or contact lenses. A few days prior to surgery a general medical examination and routine laboratory tests (such as blood count and EKG) are done to ensure that you are well enough to undergo surgery. You should not use aspirin for 2 weeks prior to surgery, since it tends to cause bleeding during surgery. Antibiotic drops are generally started one day before surgery to protect the eye from infection. The entire procedure is done under a microscope. A circular cookie cutter-like instrument, called a trephine, is used to remove the center of the diseased cornea. A “button” of similar size is cut from the donor cornea. This donor tissue is then sewn in place with extremely fine nylon sutures. At the end of the procedure, a patch and shield are applied to protect the eye. You will then be taken to the recovery room to wait until you are fully awake before being discharged. After surgery, you should rest the remainder of the day. Post-surgical pain varies from person to person. Typically, there is either no pain or only slight soreness for a few days which is usually relieved by Tylenol. Discuss pain management with your surgeon before the surgery and fill prescriptions to have available if needed afterwards. The eye drops are very important – be sure you know exactly when you should use them. Make your next appointment, usually three to seven days following corneal transplants. Be sure you know how to contact the doctor if there is a problem or you have questions. After the patch is removed, it is important to protect the eye from accidental bumps or pokes. Typically, for several months after surgery, patients wear glasses during the day and a metal or plastic shield at night to protect the eye from trauma while sleeping. Because the new cornea is delicately sutured in place, a direct blow to the eye must be avoided. Contact sports are discouraged after corneal transplant. Otherwise, normal activity can be resumed within a few days. After the first day, shaving, brushing teeth, bathing, light housework, bending over, walking, reading, and watching TV will not hurt the eye. Because the cornea has no blood supply, the transplant heals relatively slowly. Sutures are left in place for three months to one year, and in some cases if the vision is good, they are left in permanently. The sutures are buried and therefore don’t cause discomfort. Occasionally, they do break and then need to be removed. 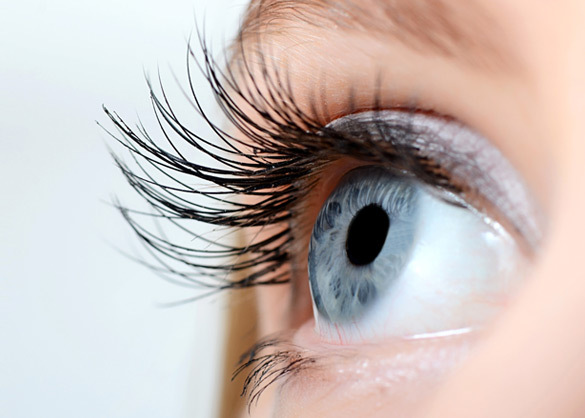 Often, they are removed, adjusted or loosened to improve vision. Suture adjustment and removal are simple, painless office procedures. The sutures used in corneal transplants are made of a monofilament nylon and are quite small (22 microns – 1/3 the thickness of a human hair). There are many different suturing patterns used by surgeons the world over. All of these suture techniques are effective. Some are utilized because of the surgeon’s preference and training. Other suturing techniques are employed depending on the specific problem for which the transplant is being done. In some cases, surgeons will use 16 individual (“interrupted”) sutures; others use a continuous (“running”) suture, which is much like a hemstitch. Still others routinely use a combination of both types. In all cases, the results are more or less equivalent. It is important to call immediately (including weekends, evenings, and holidays) if you notice any unusual symptoms, including redness, sensitivity to lights, vision loss, or pain (“RSVP”). Flashing lights, floaters, and loss of peripheral vision should also be reported immediately. Postoperative care is extremely important and by far the most time-consuming part of having corneal transplants. The eye is checked the day after surgery, several times in the first two weeks, at gradually longer intervals over the first year, and usually yearly thereafter. There is every reason to believe your graft will succeed and last a lifetime. With proper care and prompt attention to any sign of rejection the graft will remain clear and healthy. Want to schedule an appointment? Call us at 281-407-9062.